The Electro-Harmonix Holy Grail, Excellent Reverb at a bargin price.. 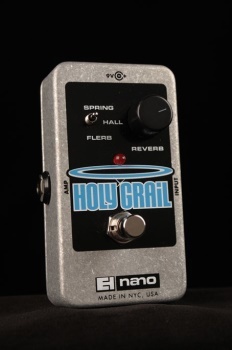 The EH Holy Grail Nano reverb pedal provides the original classic Spring reverb revered by guitarists for its authentic sound, a Hall reverb specifically designed for performing musicians, and the completely original "Flerb" - a flanged reverb with unique and haunting spatial definition. The original Holy Grail was prized for re-creating quality reverb spaces and the Electro-Harmonix Holy Grail Nano pedal delivers the same definitive reverbs while saving you pedal board space.